We all know I think Colleen Hoover is one of the best people on the planet, not to mention on of my favorite authors. I think I might have mentioned that a few times or two. Well, I have now decided she is like Santa Claus. I have not come to this conclusion lightly, but with a great deal of thought. I mean Santa is pretty magical, but so Colleen. Pretty sure she would ride across the sky on a unicorn if she could. For reals. Let’s discuss why I came to this conclusion. What are those I spy with my little eye? MY books!!!!!! On Colleen’s giveaway photo!! Me (incredulous and can hardly type): “What is happening in my world? It feels like a dream that I just got exposed like that by such a huge author.” (Reason #4…Colleen grants dreams like Santa). 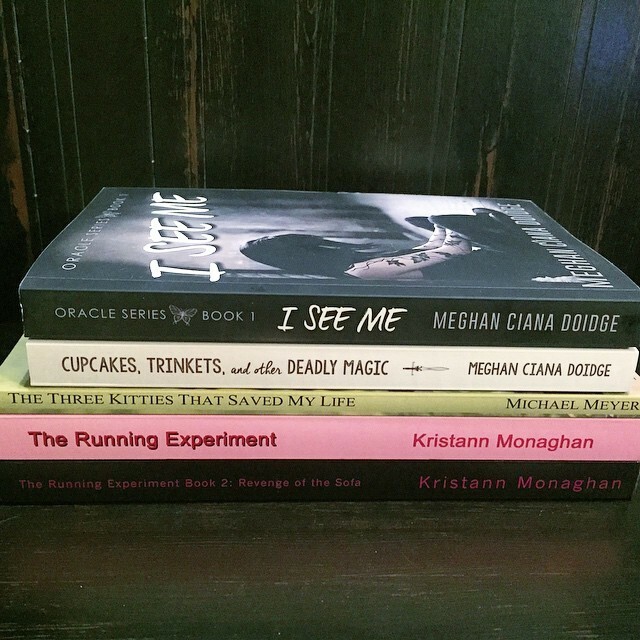 A few more screams might have come out of my mouth as I reposted the giveaway and watched people like my facebook page of The Fat Girl Running (which of course you should go do right now!!) Also I will now shamelessly provide you the links to both my books pictured above because I would be stupid not to do so! Today I have watched my twitter get followed, people follow my blog and more followers on Facebook….it is really like a dream that I got exposed like this and I didn’t even have to get naked, sell my soul to the Crossroads Demon and have Dean and Sam save me (although would that be bad? Nope.) or sacrifice Ninja Kitten in order for this dream to come true. Ever since my Seester introduced me to Colleen, I feel like things have happened that I would have normally had to do one or more of the above things for them to occur. All I did was wish like a child on Santa’s lap….although I didn’t sit on Colleen’s lap. I could have. Although then I might have looked like some weird stalker if I had babbled about sitting on her lap and climbing on it at ABF when I met her. Tarryn would have laughed at me…Colleen might have filed a restraining order. Especially since I probably would have peed my pants in excitement. Seriously…I need to wear Depends around that woman. Colleen Hoover is one of the most generous souls I have ever met (like Santa she fulfills dreams, gives away presents, gives of herself and cheer up people with her writing….need I say more?). I mean look at all she does to give back to people. I have seen her countlessly give people copies of her books (she gave me an e-copy of a novella once because I was at work and couldn’t get it!) and raises thousands for charities that she just decided to do. More and more like Santa every day. Santa sometimes can be seen ringing the Salvation Army bell afterall…raising money like Colleen. And Santa is magic that is full of good. Pretty sure the magic that is in Santa is in Colleen. 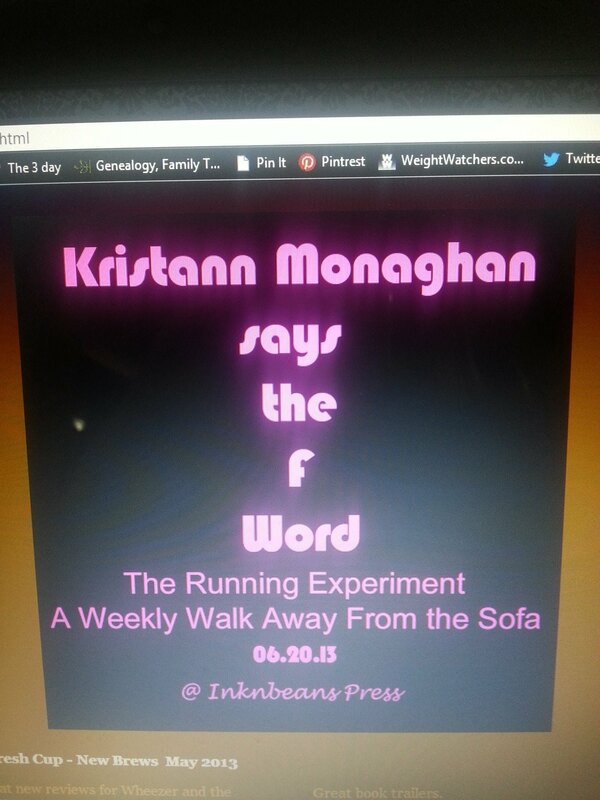 Thank you from the bottom of my indie author heart. Thank you Santa Colleen. Now excuse me while I go back to eating kumquats….because kumquats is why. Dreams Really Do Come True At Disneyland…. You know how you see the commercials for Disneyland about making dreams come true? Being an avid Disney fanatic as you all may know, I have always had three dreams I wish would come true while I was at The House Of Mouse: staying a night in the Dream Suite above The Pirates Ride, being proposed to in the park (preferably either in front of the castle where it could be captured by a photographer or on the Peter Pan ride) and meeting my FAVORITE character Maleficent. Now I used to think that all three of these dreams were out of my reach. Why? Well, let’s be honest…does anyone but celebrities ever get the chance to stay in the Dream Suite? Let’s not go into the chances of the Fat Girl getting a proposal. And as for meeting Maleficent, I was assured by several cast members that she is NEVER out in Disneyland, only in Disney World. Which to me, makes absolutely no sense since the castle at Disneyland is the Sleeping Beauty castle and the one at DW is Cinderella. But, this trip just this past week , I was able to realize one of my Disney dreams. And it was glorious. It was everything a Fat Girl could ask for and included tears, squees and some peeing of my pants. This trip was already set to be a fun one. We had a great group of people going and were celebrating 2 birthdays, 2 anniversaries and a 1st visit. I love taking people here for their 1st visit, no matter how old. It is just as much fun to take a small child as it is to take my BFF’s Mom like we did once. She even cried as the announced the opening of the park. This time it was Bubby’s Pocket GF who had never been. It is Halloween Time at the park and we even had plans to go to the special Mickey’s Halloween Party which BFF and I went to last year and it was a total blast. Plus BFF, my niece and her BF were all gonna be there for 5 1/2 days. Do you know how much fun and food you can have in that amount of time? Insert Fat Girl squeal of joy here (mostly about the food). And fun and food we did indeed have…a lot of it! Songs were made up and sang about the wonderous food at Carthay Circle (particularly the ceviche that BFF and niece’s BF sang about the ENTIRE trip to different tunes). There was so much laughter this trip that I am sure our pictures show how goofy we truly all are and turned into big kids. One of the best moments was when we took Bubby’s Pocket GF on the Tower of Terror for the first time. Pretty sure I am still giggling about how she clutched my arm, buried her head and screamed “Make it stop! Make it stop!” and then proceeded to get off and ask to ride it again! There is so much to tell you about this particular trip, but let’s get to the Fat Girl getting one of her Disney dreams realized which is something I never imagined. The night of the Halloween Party, we all got dressed up in our costumes and headed over to have some Halloween fun. We were quite the motley crew: Cruella, Batman and Robin, Psy dancing all Gangnam Style and Abraham Lincoln Vampire Slayer. When you enter for the Halloween Party, the park has been completely transformed and there is so much going on that it is a bit of a sensory overload. The decorations and lights are amazing and the characters are all out for photos and autographs including the villains. The lines for the characters and for the trick or treating was insane (yes you can trick or treat in the park!) so we continued walking down Main Street looking at all there was to see except for my niece and her BF who wanted a picture with Cruella as she was dressed like her. As we are walking, my phone rings and it is my niece. She yells “Where are you? SHE is HERE! Get back to the train station! We are in line! 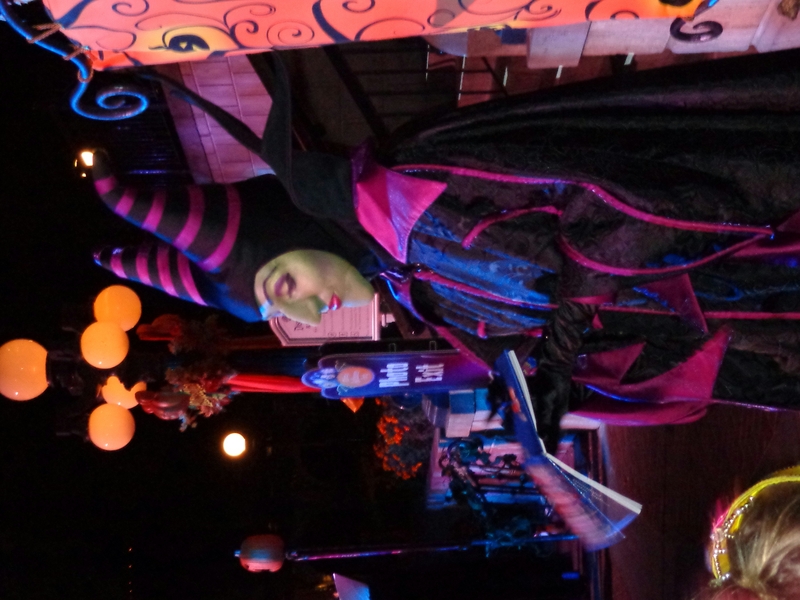 HURRY!” The SHE in this statement only meant one thing to me: MALEFICENT! I stopped dead in my tracks and BFF looked at me quizically till she heard me say “Are you shitting me? SHE is HERE? Where are you? OH. MY. GOD.” BFF instantly knew exactly who I was talking about. BFF quickly turned me, Bubby and Bubby’s Pocket GF around and we ran…and I mean RAN back down Main Street. I didn’t care who was in front of me or their ages. I was gonna see Maleficent! In person! I was praying we were not too late, that her photo line wasn’t closed when I saw my niece frantically waving at us and there SHE was in all her green glory. We quickly got up with my niece who I can never thank enough for jumping in line and forgoing her chance to get a pic with Cruella for me. I could barely concentrate on anything else going on around me as I was about to faint from the excitement like a child. This was the equivalent to a little girl meeting the Princess character of her dreams for me. I have Maleficent all over my house, every t-shirt imaginable with her on it and all sorts of memorabilia of her. It literally is my all time FAVORITE Disney character from my favorite Disney movie. The Mistress Of All Evil Herself!!! As we got closer, my excitement grew and I think everyone in my group was afraid I would plow over the small girls in front of me dressed as Princesses to get to her. I kept doing a happy Fat Girl dance and everyone was having a hard time not smiling at how excited I was. Pretty sure everyone else who was not with us probably thought I was a special ed girl and my poor family was having a hard time controlling me the way I was acting. I needed a leash. I could not alternately stop squeeing with delight and grabbing BFF excitedly and trying not to cry tears of joy. Then my dream came true. It was MY turn to meet her. Pretty sure I peed my pants a little. I could not stop grinning like a fool and literally wanted to hug her but I was scared she really would think I was mentally challenged or that in my Fat Girl excitement I would not let go and have to be pulled off by the Disney Secret Police and be banned for life from my favorite place. I couldn’t even talk so BFF told Maleficent she was my favorite and she turned to me to talk. She even asked BFF and I if we would go to the castle and bring her back the maiden with hair of gold. It was the best experience EVER. Lots of pictures were taken, more happy Fat Girl dances were done and squees of joy I am sure could be heard throughout the park. 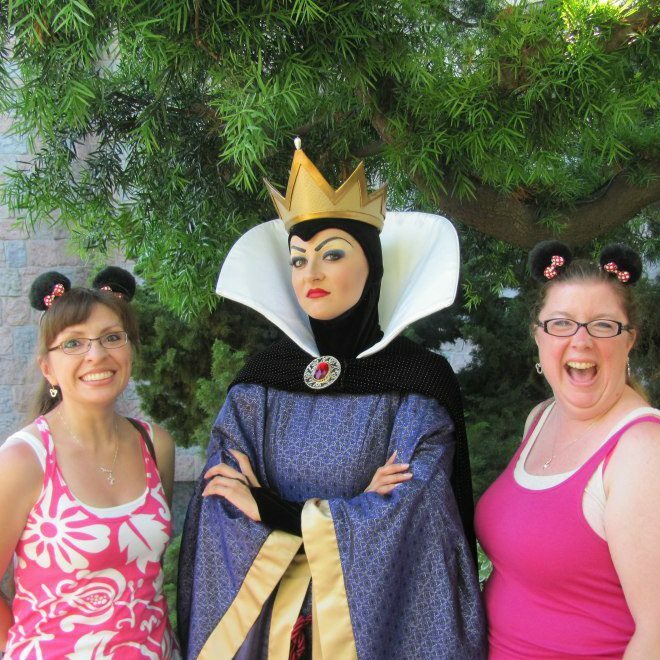 I cannot wait to get our photopass photos from that experience because I am sure I had on my Disney face like I did when I met The Wicked Queen. Example of Fat Girl Disney Face…says it all! Meeting Maleficent was the highlight of the best Disney trip EVER so far. Hands down. We can all laugh and say it was fate or it was Halloween, but I say it was a little bit of Pixie Dust and Disney Magic. It really is Where Dreams Come True. Even for Fat Girls. Now…can we work on fulfilling my other two Disney dreams? A Fat Girl can only hope….or dream. Oh yeah. I didn’t die today. A few small children may have been injured as I pushed them out of the way to fulfill a dream but I didn’t die. I am fat girl who peed her pants and became a squeeing puddle of joy when meeting Maleficient running. The experiment continues…..